If riding your bike to school is cool, consider me Miles Davis. Feelings of freedom come differently to everyone. Some learn the concept of freedom when they learn that it’s okay to color outside the lines. For others, freedom comes when they learn to read and suddenly the library becomes an oasis of knowledge where they can be free to wander. Others find freedom behind the wheel of a car where they only thing standing between them and the open road is the car with its flashing lights in the rearview mirror. While all these are measured sources of freedom, for me, the ultimate feeling of freedom manifests itself in the feeling of putting on my clothes for the first day of school, tying my shoes up tight, getting on my bike and riding to school. As a weathered pro at riding to school, I prepare for 19th grade. 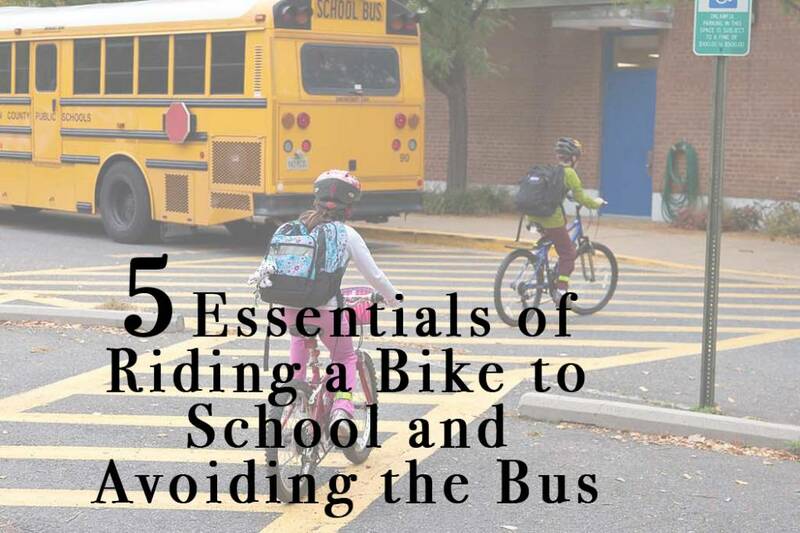 From all my years of riding to school, here are the cycling essentials to ensure students get to school safely and on time. I remember the first time I rode to school. I had on my Ninja Turtles backpack and I couldn’t be stopped. I had cleaned my bike to the best of my first-grade ability for the first day of school. I couldn’t wait to see the look on my friends’ faces when I rode to school on my bike. Needless to say when I went to the garage to retrieve my bike, I realized that my bike might be clean but it was not in a state where I could ride it to school. I had neglected the goat head filled tires and the squeaky brakes all summer long and now I would miss my first-grade debut as king of the bike rack. Before the first day of school, be sure to do a quick inspection of the bike, be it yours or your kids. If you don’t know what to look for, bring it into the shop and let us take a look at it. Don’t be like me and get walked to school on the first day when you could have ridden your bike. A major component to a bike are the tires and tubes which are riddles with eternal holes. To combat this problem, we have premium airless tires. Tannus Airless tires are similar in weight, feel, and ride quality to a pneumatic tire. With an airless tire, students don’t have to worry about the possibility of a flat tire on their educational commute. This ensures a safe and time efficient ride to school; giving you more time in the morning to eat breakfast or do the homework you forgot to do last night. Another option is simply putting in new tubes and tires. Even though the summer is coming to a close, it is still goat head season. To best protect bike tires from the atrocities of goat heads I have found the magic formula to be puncture resistant tires with a shot of sealant and tire liners. This magic combination makes your precious and supple tube into a closely guarded secret; just like the treasure map on the back of the Constitution. One of the most overlooked pieces of equipment in all of sports is the bike helmet. Most people don’t wear helmets but there is yet to be a person who can provide a good reason for not wearing a helmet. Most helmets expire 3-5 years after the date of manufacture so be sure to check and see if you and your child’s helmet is safe for riding with. Another important lesson is to lock up your bike with an adequate lock. Most cyclists can rehearse a very sad story where a bike got stolen because the ock was insufficient. For childrens’ bikes, a standard chain or cable lock is more than adequate. However, with adult bikes, the go-to bike lock is the U-lock with a cable to wind through the frame. These locks are normally hardened steel and create a big problem for anyone trying to rip off your bike. Motorists cannot avoid cyclists, especially kids if they can’t see them or are unsure if they are there. To combat this, the best solution is a bike mounted light. To aid with this problem, many modern lights can be seen in broad daylight. A quality light can ensure that all cyclists are seen and that students make it to school safely. With these tips of experience, you and your students are prepared to mount an all-out attack against the school year and discover the freedom that comes with riding to school. I rode to first grade and realized I only really loved school because it gave me a reason to ride my bike. 20 years later I an assure you I have the same motivation for going to school; the freedom that comes while riding a bike. Great post. You got a good point of views, lots of ideas and information about the parts of bikes. Thanks for sharing this post.